I have long argued that third party logistics providers (3PLs) should set themselves apart from the competition by fully harnessing the power and value of their customer and employee communities. The reason is simple: companies want their 3PL partners to provide them with insights about leading industry practices and trends, as well as to facilitate networking and knowledge-exchange opportunities with other shippers in the 3PL’s community. I served as moderator for the event and facilitated several panel sessions and group discussions. It’s impossible for me to capture in a blog post all of the great insights the speakers and other attendees shared during the event — as the saying goes, you really had to be there — but here are some of my takeaways from the sessions. The big reality in the retail industry today is that consumer needs and expectations are very different than in the past. As Debbie Hodges and Greg Forbis highlighted in their presentation, consumers are embracing different methods of buying goods and services: they are shopping online more (growing about 17% annually), using mobile technologies (up to 70% are shopping on smartphones), living in more urban areas, driving less, and visiting different store formats (not just Supercenters, but also the smaller Neighborhood Market, Walmart Express, and Walmart to Go stores). And then there are the fulfillment trends: free and fast delivery, buy online and pick-up at store, and the ability to schedule a specific delivery day and time. The open question is how to best meet those consumer needs and expectations. For Walmart, the answer depends on aggressively growing both its physical and digital assets. The company views its distribution network and stores as its greatest competitive weapon against competitors like Amazon. As Wal-Mart Stores President and CEO Doug McMillon recently commented, “There is a growing consensus that the future of retail is not just in-store and not just online. The winners in retail will be those that can put them together. Frankly, we think we’re already doing the harder part. Locations matter because convenience matters. We have the stores, the associates, and the expertise in the physical world that others will need to build.” That said, Walmart also recognizes that it needs to close the gap on the digital side too, which is why the company plans to increase its investments in e-commerce moving forward. Jason Mathers discussed the 5 Principles of Greener Freight, and provided real-world examples of those principles in action (read the Ocean Spray, Caterpillar, and Boise case studies, and alsowatch my conversation with Jason from earlier this year on Talking Logistics). Looking at the five principles, it’s clear that many of the actions transportation and logistics professionals are taking in the name of continuous improvement, cost reduction, and/or process efficiency — such as mode conversion and network redesign — often provide sustainability benefits too. In short, what I wrote back in 2008 still holds true today: “Green” is good for business, but mainly because, for the most part, only “green” projects that are good for business (or required by law or Walmart) get done. What about the role of natural gas vehicles? The question was raised by several attendees and it generated a lot of conversation. Natural gas vehicles is certainly something many companies are testing and investing in, including Ryder and several of its customers (see recent announcement). It’s also a topic I’ve written about too. Jason believes natural gas vehicles will ultimately play an important role over the long term, but more work is required, especially upstream in the process (that is, in preventing methane from escaping during the production and delivery process) to maximize the environmental benefits. Is tightening capacity a short-term trend or the beginning of a new normal? Both James Welch and Dave Belter (VP of Transportation Management at Ryder) believe that despite the cyclical nature of the industry, a new normal is emerging due to all of the regulatory changes that have occurred or are pending (such as Hours of Service and Electronic Logging Devices), and the growing difficulty in finding and retaining drivers. “We have to go through 20 to 30 applicants to fine one qualified driver,” explained Welch, with emphasis on qualified. What can shippers and carriers do to succeed in this new environment? There was a lot of discussion about the actions shippers can take to become “shippers of choice,” such as minimizing detention time and paying carriers on time. But the most important advice, which sounds simple yet doesn’t happen enough: shippers and carriers need to communicate and collaborate better and more frequently with each other. The more forward visibility shippers can provide carriers about changes in their capacity requirements, both increases and decreases, the more time and opportunity carriers will have to respond with a solution. According to a 2012 study by The Georgia Center of Innovation for Logistics, the logistics industry is expected to create 270,200 job openings per year through 2018 (not only in trucking, but in warehousing and distribution labor and other areas too). But this demand for talent greatly exceeds supply. What is the biggest challenge in closing this gap? That was my opening question to Ellen Voie and John Diez (Sr. VP of Ryder Dedicated), and they both pointed to an underlying perception problem in the industry: many people, especially those entering the workforce today, view trucking and logistics as a job instead of a career. Changing this perception, therefore, is a critical first step — especially in attracting more women to the industry, which would help close the talent gap and alleviate the driver shortage issue (see recent article in the Chicago Sun-Times about women drivers). (Ellen Voie will be my guest on Talking Logistics soon, so stay tuned for more great insights on this topic). John Gleason (Sr. VP Sales and Marketing, Fleet Management Solutions at Ryder) joined Mark on the panel and discussed Total Cost of Ownership. Some of the key cost factors companies need to consider include vehicle acquisition/lease costs; maintenance, repair, and service costs; insurance costs; fuel costs; tire costs; out-of warranty repair costs; and driver training and salary. Toby Brzoznowski, together with Gary Allen (VP Solutions and Execution Standards at Ryder), positioned Supply Chain Design as “the third discipline of Supply Chain Management,” where companies create models to represent the structure and policies of their existing supply chain; use advanced analytics to find a better or more appropriate future state; and continuously run what-if scenarios to test new strategies and to react to changing market conditions. 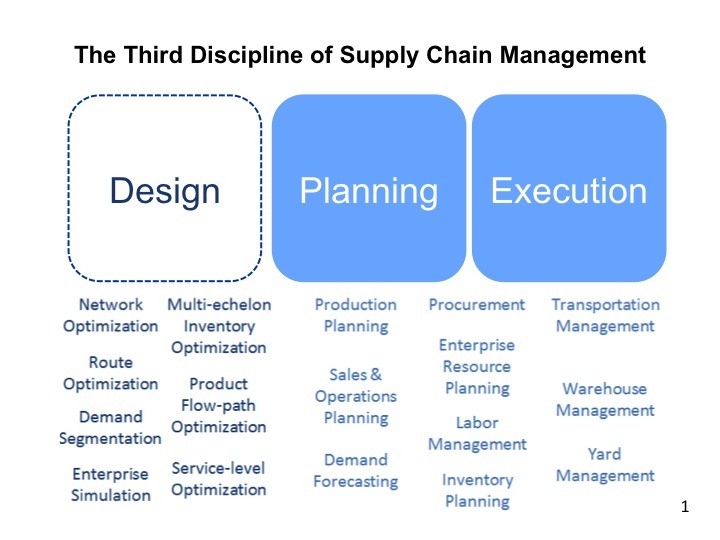 Supply Chain Design is becoming more operational and real-time versus a one-time event. The tools are becoming far more advanced, accessible, and affordable compared to other enterprise software solutions. Best-in-class companies are either developing Supply Chain Design competency in-house or expecting it as part of outsourcing relationships.